Informazione prodotto "Pioneer DJM 750 K"
The Pioneer DJM 750 K is a powerful 4-channel DJ Mixer made by Pioneer and features a lot of innovative functions. 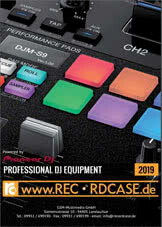 The “BOOST COLOR FX” feature is one of the comprehensive functions of this DJ Mixer. Just by intuitively rotating a single knob, the feature enables you to highlight exciting parts of music and add breaks with simple controls. Thanks to the ability to change parameters of effects linked to the speed of knob rotation, the range of musical arrangements possible is expanded. The Pioneer DJM 750 K” can also be used to suit the music and mood as it incorporates the highly rated “SOUND COLOR FX” from Pioneer. You can use this feature while switching between the "SOUND COLOR FX" and “BOOST COLOR FX”. You will be able to create highly original remixes with this DJ Mixer. The “BEAT EFFECT” function of the Pioneer DJM 750 K provides 13 types of effects and can be combined with “BOOST COLOR FX” and “SOUND COLOR FX” to produce approximately 100 types of effects. 24bit/ 96kHz high-sampling processing enables various sound signals to be input-output with no deterioration in sound quality thanks to a built-in USB sound card enabling simultaneous input-output of stereo signals for four inputs and four outputs*. The Pioneer DJM 750 K can be used not only for DJ play, but also for music recording and production as it delivers Support for three sampling rates (96kHz/48kHz/44.1kHz) and ASIO/Core Audio standards. You can also simply modify the signal output path from the mixer as necessary by using the setup utility tool** installed on a PC. For easy swapping of connectable devices, the USB port is positioned on top of the device. The Pioneer DJM-750 K also provides playback faithful to the original sound thanks to the low-jitter crystal oscillator installed in the clock of its audio circuits. The DJ Mixer adopts high sound quality parts such as the 32 bit Digital Sound Processor from other Pioneer DJ mixers to improve Sound quality further. When a state of no use or no input continues for a certain period of time, the built-in environmentally friendly “auto standby” function switches to standby mode. • Information from operation of the device's knobs and buttons is transmitted to external DJ software and effectors, etc. as a MIDI signal***, with a “Full Ensemble MIDI” function built-in to enable simultaneous control of this device and external devices. • Equipped with switch-type 3-band equalizer (+6 dB to –26 dB) and 3-band isolator (+6 dB to – unlimited dB) on each channel. * Windows/Mac OS supported. For Windows, distribution to three or more systems is possible only when using software that supports ASIO. ** USB sound card functions can be used by installing the driver software and setup utility software from the CD-ROM that is included. *** Standard for linked performance with electronic music instruments. The illustrated or mentioned Multi Player Pioneer CDJ-850 is not included in delivery. It is available separately in our shop. Sii il primo a scrivere una recensione per: "Pioneer DJM 750 K"